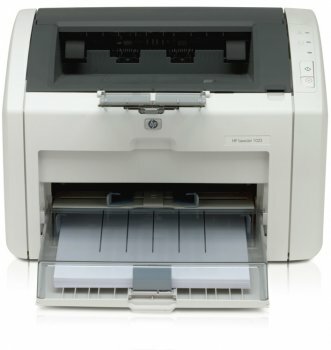 HP LaserJet 1022 - is an advanced model of popular printer, A4 format. Thanks, this printer is ideal for both home and small office. The printer uses modern black and white laser printing system, speeds up to 18 pages per minute. However, maximum printing format A4. The maximum resolution of your printer when printing 1200x1200 dpi. The type of cartridge used in the printer HP 12A Q2612A, it is enough to print the 2000 pages of A4 format. One of its advantages printer is connected to the network through Wi-Fi and Ethernet. The dimensions of the printer are 370x245x241 mm and a weight of 6 kg.